San Francisco witnessed four cyclist and twenty-one pedestrian deaths from collisions with cars in 2013. Unanimous agreement echoed through City Hall last Thursday (January 16, 2014) that this is twenty-five people too many. 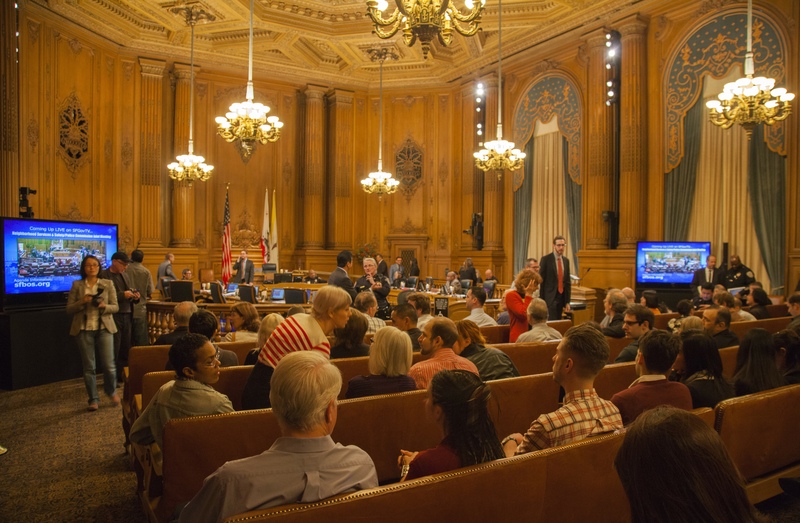 The event was a joint hearing before the Police Commission and Board of Supervisors’ Neighborhood Services and Safety Committee, and the call to action came from citizens and organization such as the San Francisco Bicycle Coalition and Walk San Francisco. These and other organizations are asking city officials and law enforcers to commit to ‘Vision Zero,’ a policy goal to reduce traffic deaths to Zero within ten years. The concept began as a road safety project in Sweden in 1997, has recently been adopted in Chicago and New York, and is now clearly working it’s way to San Francisco. During the hearing, SF’s police chief, Greg Suhr, committed to this ‘Vision Zero’ and Supervisor Scott Wiener called for more government accountability when it comes to executing these wildly popular pedestrian and cyclist safety resolutions. ‘The three E’s’ came up a lot: Education, Engineering, Enforcement. Enforcement was most emphasized element of the night. In particular, more, more, more citations. Law enforcers will ensure that people in the city, drivers and cyclists alike, stop at stop signs and withhold from using cell phones while driving. From my understanding, citations on the spot for any collision with minor injuries where there is a determination of fault will be a new initiative. As a linguistic choice, they will also cease using the word ‘accident’ and instead use ‘collisions.’ Why? The term ‘collisions’ implies more actively that crashes are preventable. With the enforcement emphasis came a conversation about a culture shift to stop blaming the victim. There’s still a dominant perception law enforcement and elsewhere–perhaps mostly subconscious–in which the ‘vulnerable road user’ who gets hit is blamed for the ‘accident.’ But the fact is, 2/3 of pedestrian accidents are the fault of the driver. Another shocking statistic that came up: Only 20% of trips in SF are made on foot; more than 50% of traffic collisions are with pedestrians. Several speakers, including the Bicycle Coalition’s well-spoken executive director, Leah Shahum, emphasized education initiatives for all road users, with a particular focus on professional drivers and law enforcers, but also on other road users, from drivers to cyclists to walkers. As per engineering, it almost seemed a given that the most dangerous intersections in San Francisco should be a main focus both enforcement and street re-design. There much more emphasis on enforcement than engineering this night, though, which is what I’d expect in a hearing with the Police Commission. I will say that my favorite comment from the public pertained to engineering, and it came from a 20-something bearded cyclist who called for a more radical redesign of our transportation infrastructure. He spoke of his recent travels to Germany where cars aren’t allowed in the center of many cities. It made more sense, he argued, to reserve high-traffic public space for walkers and bicyclists rather than for heavy chunks of speeding metal. I, for one, see his point and support this kind of radical re-design. As with everything, there was also call for more funding during the hearing. Always, everywhere with the more funding plea. Sigh. I wish money wasn’t always the main measure of implementability.